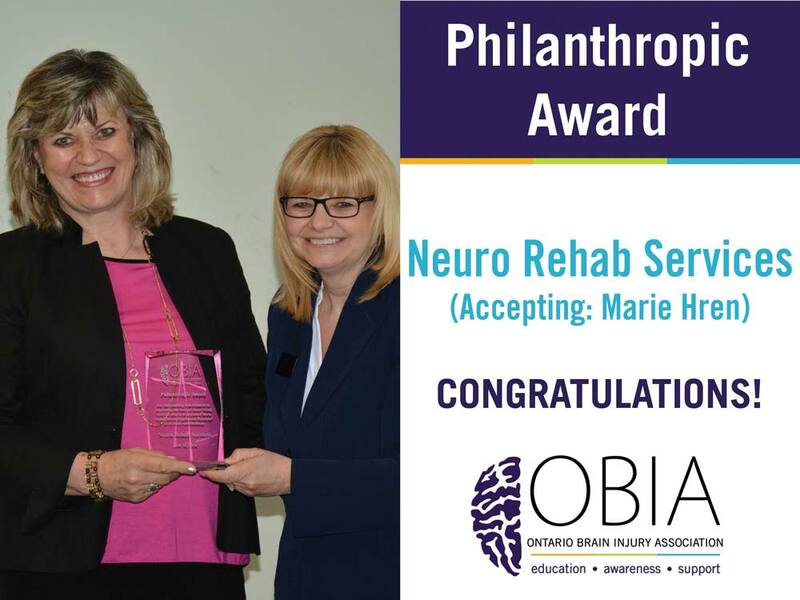 news Archive - Neuro-Rehab Services Inc.
NRS is pleased to have been chosen as a 2018 recipient of the Ontario Brain Injury Association’s Annual Philanthropic Award for outstanding commitment to improving the lives of those living with the effects of acquired brain injury through generous financial or in kind contributions. Marie Hren, Co-Director of NRS, accepted this award at the OBIA AGM on June 16, 2018. Ruth Wilcock, Executive Director of OBIA, thanked NRS for celebrating its 30th anniversary on October 3, 2018 at Second City as a tribute to OBIA, as it too celebrated its 30th anniversary, and for its generous donation of the proceeds of the event. NRS thanks OBIA for this kind recognition. It is, as always, an honour to support the excellent work OBIA does in the area of education, awareness and support. Those with serious non-CAT injuries will have only $65,000 combined med/rehab and attendant care. Those with CAT injuries will have only $1,000,000 combined med/rehab and attendant care. The NRS team has in place the following strategies, which will ensure the best use of available funds. There will be an even greater need for collaboration between the lawyer, rehab team, client and family to identify priorities. To that end, NRS offers case coordination by experienced rehab therapists, at the cost effective, non-regulated provider rate. As legal counsel, you can rely on our case coordinators as you do our case managers, with the only difference being that the case coordinators will focus on essential tasks- leaving the maximum amount for therapy. Our case managers (CAT cases) and case coordinators (serious non-CAT cases) help families access all available public and free services. They are highly skilled at ensuring effective communication between public and private providers. The result: cost effective, outcome oriented programming, with best use of the private funds available. NRS has over 50 skilled RSWs covering the GTA. Travel time is typically 30 minutes or less. Our coaches work under the supervision of our experienced OTs, PTs, SLPs, and Social Workers. The outcome: high quality treatment that is also cost effective. NRS Case Managers, Case Coordinators, Therapists, and RSWs are using e-rehab wherever appropriate, meaning more funds go to treatment vs. travel. Direct therapy, such as Social Work counseling. Supervision of RSW’s by therapists. We also use the Cloud/Google Docs apps to ensure clients, families and team members have constant access to client schedules, programs, updates etc. Our reports concisely document client progress towards their functional goals – ensuring the maximum funding for treatment vs. reporting. With limited funds available, setting priorities will also be even more critical: our multidisciplinary progress reports not only reflect our strong team approach but also offer cost savings. The Bike Helmets on Kids event held in May 2015 with Torkin Manes Law firm was a huge success! We gave away 300 helmets at the East York Town Center. People were lined up before we were even set up and for many kids, this was their first helmet ever. NRS staff provided information and brochures on brain injury prevention, the Toronto Police were on hand to ensure proper helmet fit and the Scouts ran an obstacles course to teach safe riding which was enjoyed by all. We are thrilled that the Ontario Brain Injury Association will be joining NRS and Torkin Manes this year to co-sponsor the May 14, 2016 event. Stay tuned for more information! Click here to download the Helmets on Kids Event Poster! Congratulations to our own Patricia Howell, who was nominated a second year in a row as well, this time in the category Health Care Provider of the Year. With over 25 years’ experience in Case Management, Occupational Therapy and Life Care Planning, she has helped 100’s of adults, adolescents and children achieve their fullest potential following brain injury. We also commend her on her incredible contributions to the brain injury community over the years, as an educator and advocate. To learn more about Patricia, click here.